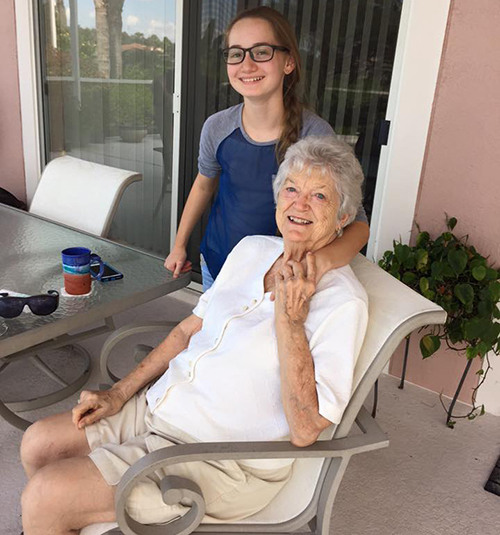 My rich, full life as wife, mother, business partner in two companies, social justice warrior and free-lance writer was recently, and quite unexpectedly, expanded into the realm of also being a full-time daughter to an 88 year-old mother who suffered a stroke. Mom lost the feeling on her right side, and she suffered some hiccups to her memory, but thankfully she kept all movement and function. She can dress herself, walk, talk, eat and smile, and she is getting stronger every day with therapy. However, she cannot live alone anymore, and she cannot drive. My brother and I had to put her house on the market, sell her car, pack her things and move her in with my husband, my daughter and me. It’s a new day now – helping her shower, ensuring she takes her meds, icing an ankle she didn’t know she injured, running her to doctors, paying her bills and keeping her books. At the same time, I must live my other life, as well: helping my amazing 12 year-old rocket to the end of her honors filled 6th grade; helping my husband run his record label and staying ready in case he has to leave last-minute to work six months on a feature film; keeping our personal books and our company finances in order; fighting to save our golf course community from commercial development, leading a justice team at church and, through it all, writing. As much as this increased activity is more demanding on my time, and as much as it frustrates me because I have to fight even harder for that precious time to write, I am grateful. My mother could have died from her stroke, or been permanently disabled. In fact, this has taught me that, on any given day, a similar tragedy could strike. I could lose my family in an accident or my home in a fire. I could become homeless or get struck with an illness that cannot be treated. And even though I don’t have to face any of those realities right now, I could, and they could happen just as quickly as my mother’s stroke. It’s that potential in my own life that makes me more compassionate and sensitive to that reality in the lives of others. And isn’t that what writers do, at least in part? My upcoming novel, The Vessels, is about a group of young people become hosts to Spirits that return to this life in order to fix problems from their past. The Spirits find or give forgiveness, restore love, heal relationships, etc. And as daring and challenging as that is, for Spirit and Vessel alike, it’s the qualifications to become a Vessel that relates most. One must be at the lowest, most painful and most broken point in one’s life, with no family, hope or love left, in order to understand, accept and then share the power of compassion, empathy and serving that lifts them out. These Vessels had spouses, children, partners and parents wrenched away from them in death. One is a fugitive who was wrongly imprisoned for a murder he did not commit. The heroine is a cop who not only watched her husband and young son die in a fiery crash, but held her best friend and partner as he died after getting killed in a raid she was accused of ruining. None of these individuals have anywhere to go but up, and that’s exactly what the Vessels program and the Spirit journeys provide. It seems to me that what makes us better writers is what makes us better people: using our own experiences, as well as the “almosts,” the “what ifs” and the “might have beens” in our lives, to create worlds that give characters who do suffer these things a voice. They, in turn, can reach readers and serve others in ways that we in real life cannot. Writing stories allows us to walk in each other’s shoes, share in each other’s lives, feel the hurts and joys of even the most distant stranger in a way that resembles our own. Not only creative and fulfilling, writing provides a means of serving others, without judgment, by serving our characters who reflect others. What a challenge. What a gift. What a call. This is incredibly moving! Thank you for sharing your thoughts, your journey, your fairness — Not only through your amazing writing, but with me in life! Thank you, thank you…Now I can’t wait to read that novel! This is great . I may have to reply by Jo Ann ‘s email which will be fine. Love to see ya’ll !!! Nice post, Anna! Keep it coming. Well put, Anna. Writing is a calling, and it challenges us to share a slice of the human condition (even if we are writing about aliens) and to strive to make it as real as our abilities allow, which makes it the best gift we could have been blessed with and the work itself becomes a gift for others. Thank you for this! Sorry for such a delay in replying. I’m glad you like the concept of this book; it’s near to my heart, as well. When the publisher is ready to release, I will create a mailing list and put you on it. I look forward to meeting you one of these days. Aw, this was a very nice post. Taking the time and actual effort to create a good article… but what can I say… I procrastinate a lot and don’t manage to get anything done.